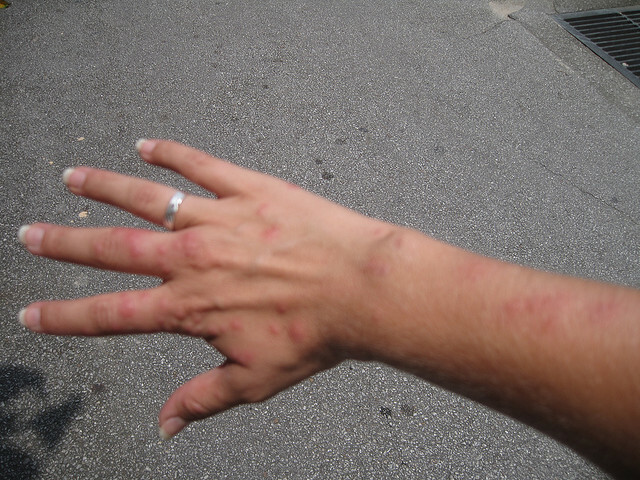 Here you will find a large collection of bed bug bite pictures showing the wide range of symptoms people experience in reaction to bed bug bites. 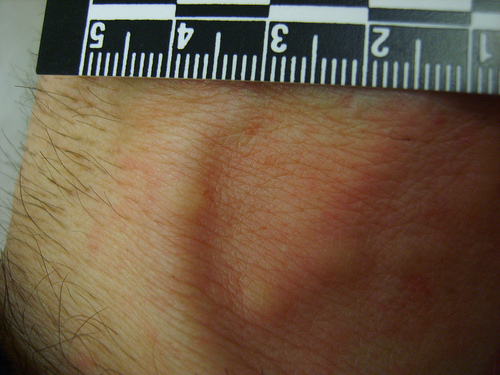 There's even a series of bed bug bite photos that demonstrate the stages of reaction over time - from the first appearance of bed bug bites to when they are nearly healed. 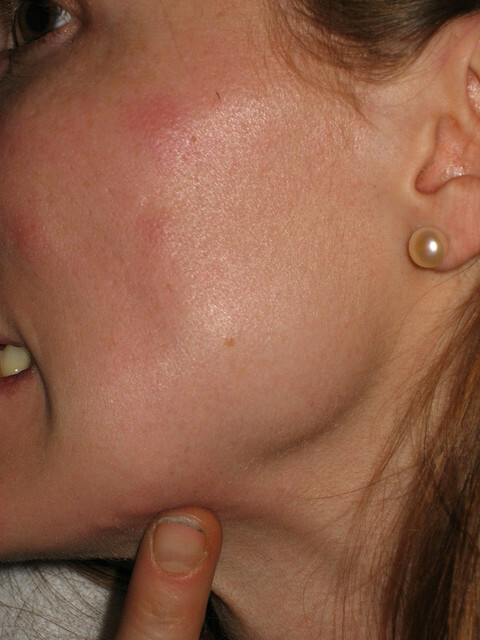 Bed bug bites often appear first on the head, face and neck. 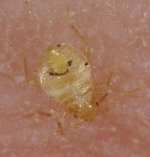 Bed bugs search out exposed skin on which to take their next meal. That makes your head, face, and neck prime targets. 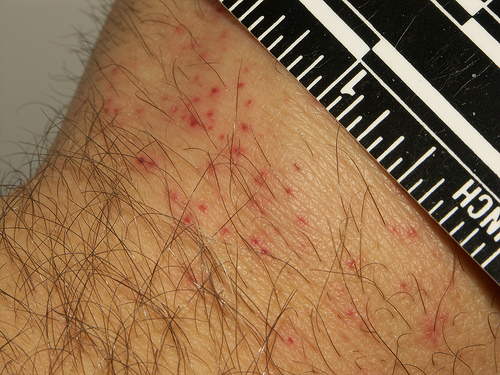 Bed bug bite symptoms vary from person to person. 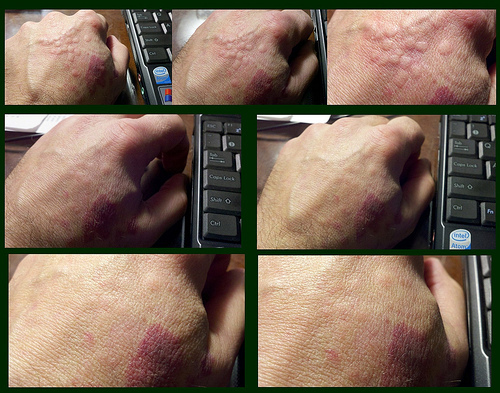 The bed bug bite picture above shows a minimal reaction, while the bites in the picture below caused a more serious allergic reaction with swollen red welts. 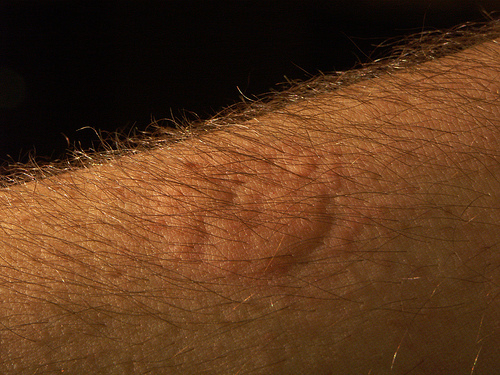 The symptoms of bed bug bites mimic many other insect bites and allergic reactions. Hands, arms and legs are also favorite targets. 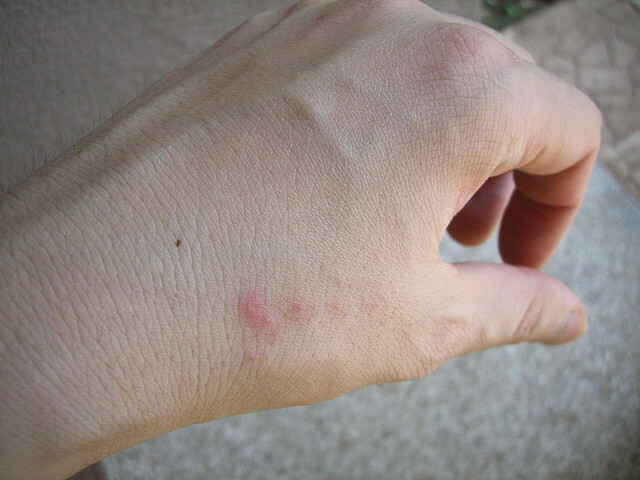 The picture above shows minimal reaction to bed bug bites on the hand, while the photo of bed bug bites below demonstrates clearer signs of allergic reaction. They will also feast on your shoulders, back and any other body part that's left uncovered. Bed bugs cannot bite through clothing so they are always going to look for exposed skin. Bed Bug bite symptoms often mimic other things. 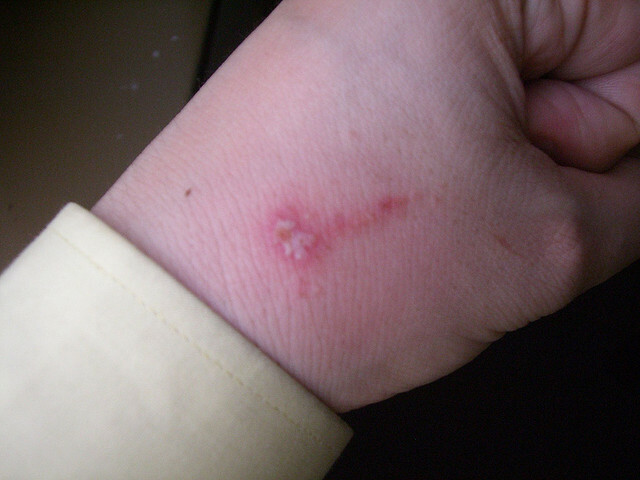 The photo below shows how bed bugs bites can cause a rash type of reaction with red raised blistery bumps. It even looks a little like poison ivy. 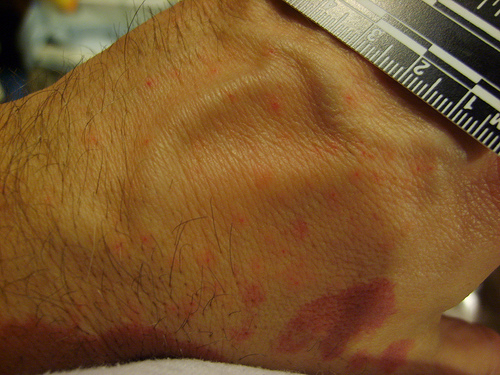 The photo below shows bedbug rash type symptoms as well....but this time it look a little more like chicken pox. Bites alone are not enough to determine whether or not you have bed bugs. Learn the common signs of bed bug infestation and how to inspect for them. Bed bug bites can get infected without proper treatment. ...and then the complications with infection just one day later. Properly treating bed bug bites is simple if you know what to do. Read more about bed bug bite treatment and what really stops the itch here. In this photo collage, Lou Sorkin, Entomologist at the American Museum of Natural History shows the series of reaction he has to bites after feeding individual nymphs and adult bed bugs in the lab. 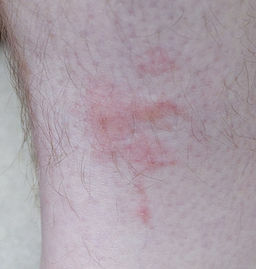 The entire sequence lasted just one hour from the initial appearance of bed bug bite symptoms to almost no visible sign of bite marks at all. Note: The dark red blotches on his hand that look a like wine-colored stain are a birthmark, not the result of bedbugs. 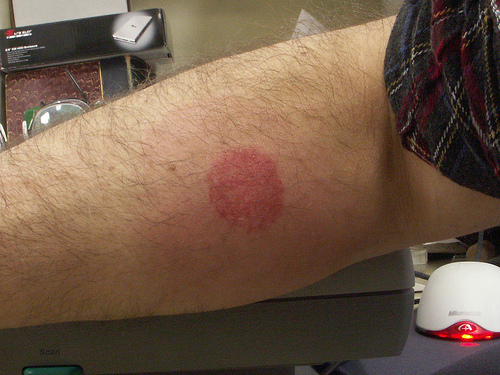 The bed bug bite picture below shows the first appearance of bed bug bite reaction shortly after feeding a number of bed bugs in the lab. 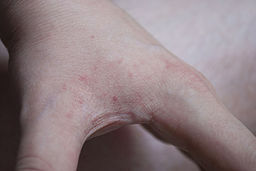 Almost immediately the bites cause general redness, inflammation, and raised welts much like mosquito bites typically do. 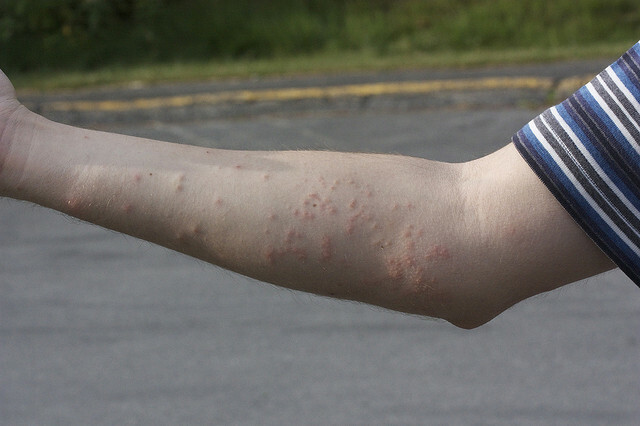 The photo below depicts the symptoms of the same bed bug bites 6 hours later. The swollen itchy welts have been replaced by red bumps - looking more like a bed bug rash of sorts. Note: The dark red stain-like marks on Lou's hand and arm at the bottom of the photo above are not from bed bugs. They are birthmarks. As you can see, there were many bed bugs feeding on this one small stretch of skin. Not only is he one of my favorite entomologists (insect scientists)... Lou Sorkin is a very brave man indeed! Immediate and delayed reactions to a bed bug "feeding frenzy". This pair of bed bug bite photos below show the immediate (left) and next day (right) reaction after feeding a colony of bedbugs from a container in the lab. (That's why they are contained in a small circular area). 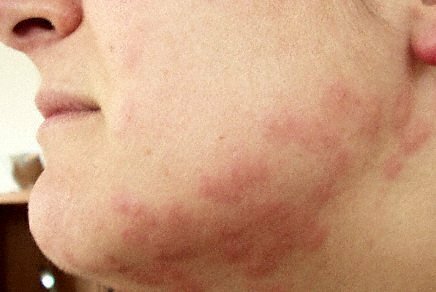 The hive-like immediate symptoms are replace by dark red rash type reaction the following day with inflammation and less severe redness radiating out to a larger area. Note: Bed bug bites are not poisonous - these symptoms are merely an allergic reaction to the bed bugs' saliva. The bites in these pictures above are the result of an entire colony of bed bugs feeding in one spot and the larger area of reaction the next day is likely due to the high concentration of bites in one small area - it is not the spread of venom that is common with spider bites. Hopefully, this bed bug bug bite picture collection has given you a better idea of what common symptoms of bed bug bites look like. Here are links to other helpful pages in the Bed Bug Picture Gallery. Visit the bed bug bites section to learn more about bite symptoms, prevention and treatment.